EMT jobs are available here at MedStar Ambulance. As a locally owned and operated medical transportation company, we offer the area’s top employment opportunities for EMTs and paramedics. Our EMT jobs and the EMT salary we offer provide dedicated medical professionals with the opportunity for a career in emergency care that’s exciting, varied, and rewarding. As the area’s leading ambulance service, we provide timely, professional and effective medical transportation service to a variety of key medical and healthcare facilities in the region – from central Massachusetts’ busiest hospitals and emergency care centers to nursing homes, rehabilitation facilities, and municipalities of all sizes. We attract some of the most experienced and sought-after EMTs and paramedics because of our fleet of well-equipped, state-of-the-art ambulances and emergency medical technology. Our EMT jobs enable our staff to work with advanced wireless technology, including paperless, secure communications and record-keeping. That means they can be in touch with physicians and other medical staff at healthcare facilities faster and with better outcomes. If you’re considering an EMT job in any of the surrounding communities, or looking to advance your emergency medical care career as an EMT or paramedic, talk with us and learn about all that MedStar has to offer. Our EMT salary schedule is highly competitive and the chance for advancement unmatched. 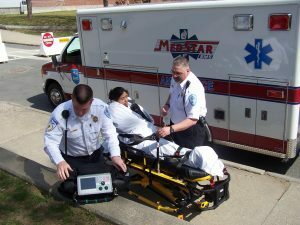 An EMT job with an outstanding EMT salary at MedStar is a great way to further your career.